HowMechanismWorks ? : How does a Radiator Works ? How does a Radiator Works ? 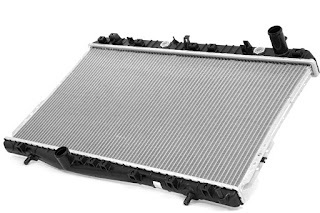 The radiator is always a source of heat to its environment, although this may be for either the purpose of heating this environment, or for cooling the fluid or coolant supplied to it, as for engine cooling. Despite the name, most radiators transfer the bulk of their heat via convection instead of thermal radiation. In this article we will learn about what is the purpose of Radiator in an Engine. Basically Radiators are used for cooling internal combustion engines, mainly in automobiles but also in piston-engined aircraft, railway locomotives, motorcycles, stationary generating plants and other places where such engines are used.So, we know that engine produces a lot of heat when it is running, and must be cooled continuously to avoid engine damage. Up to the 1980s, radiator cores were often made of copper (for fins) and brass (for tubes, headers, and side-plates, while tanks could also be made of brass or of plastic, often a polyamide). Starting in the 1970s, use of aluminium increased, eventually taking over the vast majority of vehicular radiator applications. The main inducements for aluminium are reduced weight and cost. How Does Radiator Works ? Radiators works on the principle of physics specifically thermodynamics, that says heat will always tend to travel from an area of high concentration to an area of low concentration. Something that is hotter will always transfer heat energy into something that is cooler. The metal parts around the combustion chambers in the engine are always hotter than the coolant in the passages surrounding them, so the some of the heat in the metal gets transferred into the coolant because of this property of thermodynamics. When your engine warms up to operating temperature the thermostat opens. This lets coolant flow to the radiator to let off heat and keep the engine at its correct temperature. When the hot coolant gets to the radiator it goes from being in one big hose into a bunch of small tubes that have aluminum fins all over them. The fins are oriented in a way that allowes air to pass through them from the front of the car (with the fan at low speeds). By spreading out the hot coolant into small tubes with a lot of surface area (including the fins), the radiator causes the hot coolant to let off a lot of heat before being circulated back into the engine. This system keeps the engine at the correct temperature no matter what the outside temperature is because the thermostat will only open once it is at the correct temperature and will stay open for as long as it takes to keep the engine at the right temperature.And this procedure keeps on repeating as long as the engine continues to run. In absence of radiator or in case of an issue with the radiator the function of the engine will cease and it will overheat. This coolant is usually water-based, with the addition of glycols to prevent freezing and other additives to limit corrosion, erosion and cavitation. However, the coolant may also be an oil. The first engines used thermosiphons to circulate the coolant; today, however, all but the smallest engines use pumps. 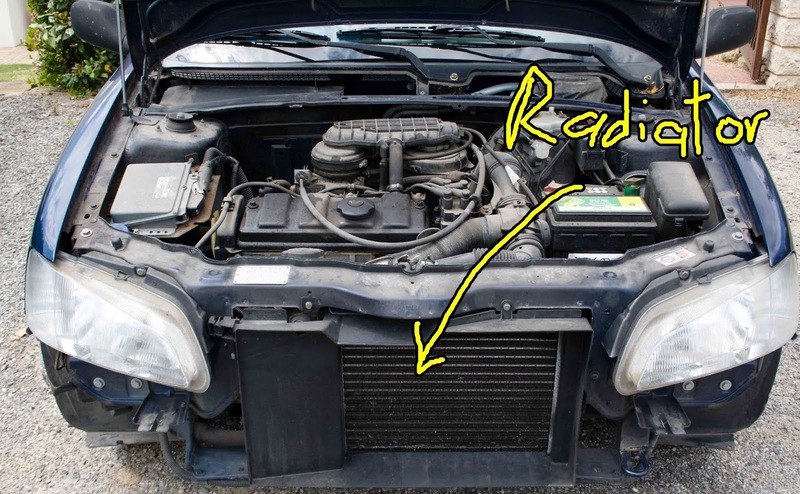 Since air has a lower heat capacity and density than liquid coolants, a fairly large volume flow rate (relative to the coolant's) must be blown through the radiator core to capture the heat from the coolant. Radiators often have one or more fans that blow air through the radiator. To save fan power consumption in vehicles, radiators are often behind the grille at the front end of a vehicle. Ram air can give a portion or all of the necessary cooling air flow when the coolant temperature remains below the system's designed maximum temperature, and the fan remains disengaged.